Okay, I am not sure exactly how many times I have been to this bakery, but it’s a lot (see here and here). They put up three new items on their Tumblr/Instagram feed last week – the morning bun, gingersnap quince cube cake, and, yes, I will drive up to San Francisco to try the Thanksgiving dinner pop-tart. The best item I tried this was actually the pear and yuzu croissant. 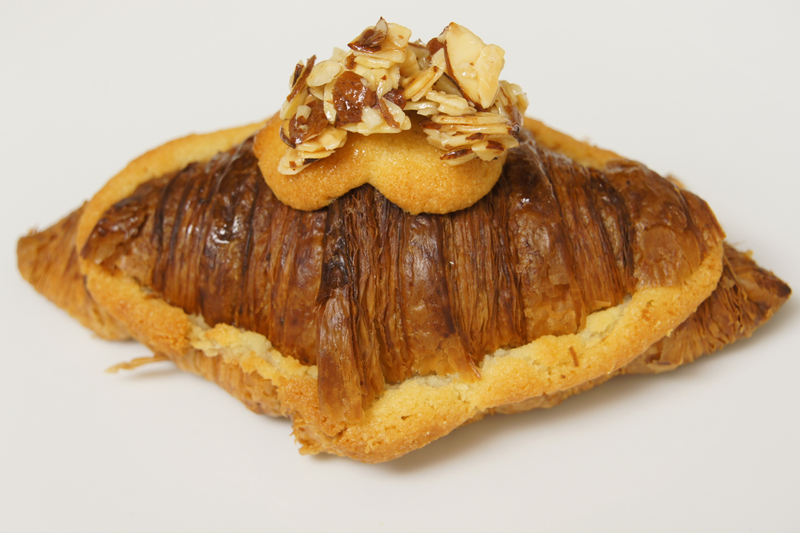 A buttery, flaky croissant filled with roasted pear and bits of yuzu citrus, adorned with a candied almond sculpture. Brilliant and delicious. Eggplants are a staple vegetable (well technically, a fruit) in the Middle East, and feature prominently in Ottolenghi’s Jerusalem: A Cookbook. 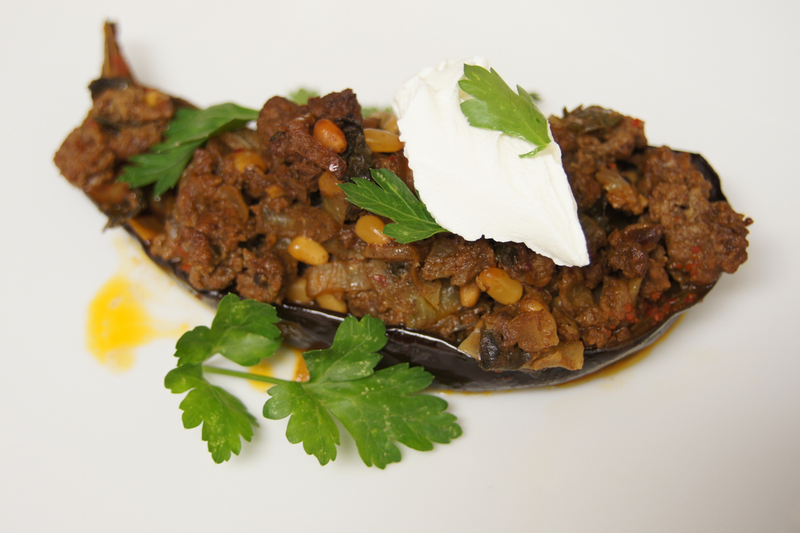 In this recipe, the eggplant is roasted first, then stuffed with a ground lamb and pine nut filling, then braised in a spice liquid. The filling is made with ground lamb, onions, pine nuts, and parsley, fragrant with cumin, cinnamon, and paprika. Think the world’s best sloppy joe filling. After roasting, stuffing, and braising, the eggplant is transformed from its raw firm and dry texture to a luscious creaminess that almost acts like a sauce for the aromatic lamb and pine nut stuffing. I finished with a little bit of Greek yogurt for an added dimension (there is always some around since I started cooking from this cookbook). By the way, I like the British word for eggplant, aubergine. Aubergine sounds so much more sophisticated, borrowed from the French and Arabic. Eggplant, however, is actually not a misnomer as I first thought. When the word eggplant was first coined, it referred to a variety that had pale white skin and was indeed the size and shape of an egg. But still, aubergine seems more fitting for the beautiful purple varieties that are more commonly available today. Link to recipe here. Link to Jerusalem: A Cookbook here. These turkey meatballs are from Ottolenghi’s Jerusalem: A Cookbook. They are easy to make and delicious. I add the salt to the shredded zucchini for about 15 minutes to draw out the water, prior to mixing with the turkey, egg, herbs, and spices. The meatballs come out juicy and fluffy and are aromatic with cilantro and mint. The sour cream-yogurt sauce with sumac adds cool creaminess. This is a beautiful, delicious, easy recipe from Ottolenghi’s Jerusalem: A Cookbook. Butternut squash and red onions are roasted at 475 for about 30-40 until there is some caramelization. The vegetables are then paired with a tahini sauce. Tahini is crushed sesame seed paste and a common ingredient in Jerusalem. The dish is finished with pine nuts for crunch, za’atar spice blend, and parsley for color. 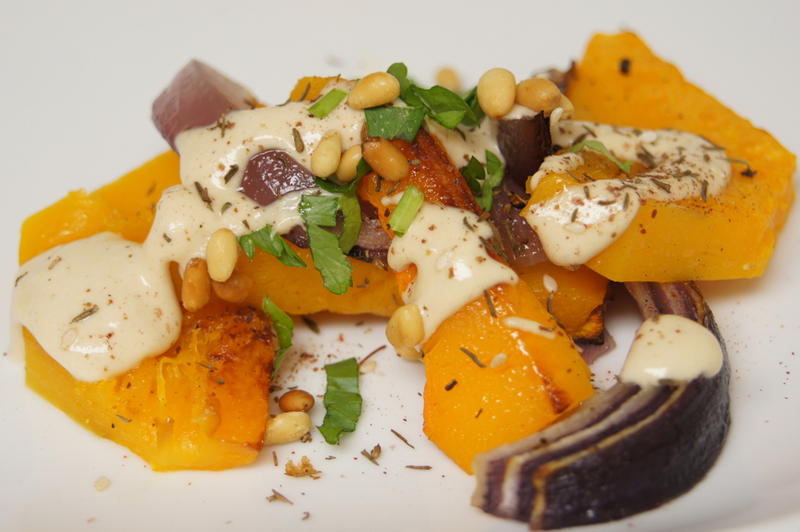 The nutty tahini really complements the caramelized squash and red onions. This would be a great vegetarian main course or side. There is an interesting section of sweets in Ottolenghi’s Jerusalem: A Cookbook. Chocolate krantz cake is like a chocolate babka, with a sweet leavened dough layered with chocolate and nuts. The dough must rise overnight, then is rolled out and layered with chocolate and pecans, rolled up, split, and twisted back together to create all the layers. It then proofs for 90 minutes before baking. The recipe recommends baking for 30 minutes at 375. At that point, the crust is browned and a toothpick inserted into the center came out dry, but the bottom layers were a little underdone. It might take 10-20 minutes longer than suggested to bake through, depending on your oven. After baking, a simple syrup is brushed onto the cake. The cake was rich, sweet, and chocolately, and got good reviews, but is a little bit involved to make. This is a fantastic dish from Ottolenghi’s Jerusalem: A Cookbook. 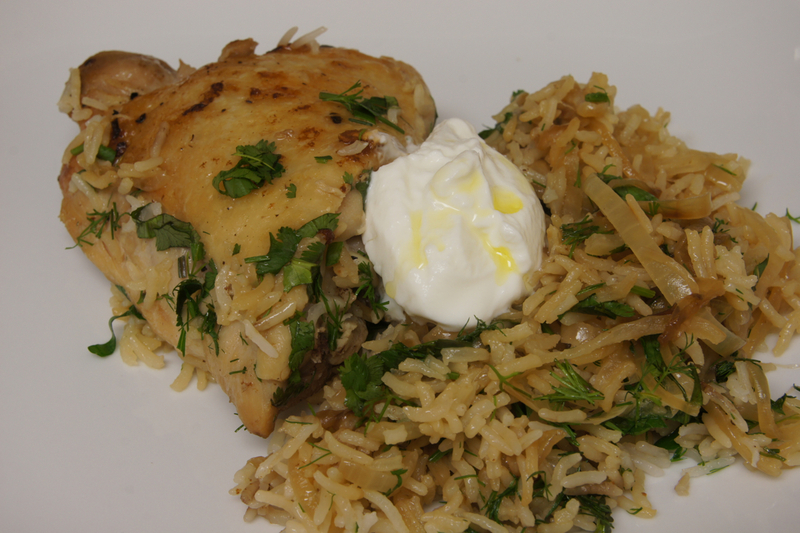 Chicken is cooked together with caramelized onions, basmati rice, and spices including cardamom and cloves. The chicken becomes fragrant from the spices, the rice soaks up flavor from the chicken and spices, and the caramelized onions lend sweetness and depth. 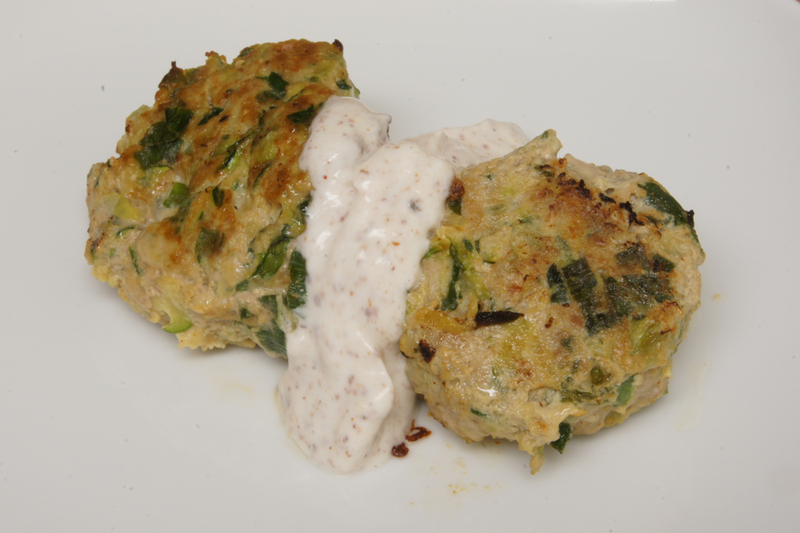 The dish is finished with fresh herbs and a dollop of Greek yogurt. It’s great one-pot cooking. I made it with four chicken thighs, but I think there is enough rice for six servings. Beware of biting into some of the whole cloves and cardamom pods. Jerusalem: A Cookbook is the third cookbook by Yotam Ottolenghi and Sami Tamimi, following Ottolenghi and Plenty. Ottolenghi is a UK-based chef who has several restaurants and take-out delis in London. There was an amazing write-up in the New York Times in July 2013 about how Jerusalem was the cookbook of the moment. I recently got a copy and can now understand why the book has been so popular. In Jerusalem there is a convergence of Jewish traditions from Israel and Europe and Middle Eastern and Mediterranean influences. One of the authors is Israeli, and the other is Palestinian, and the dishes in the book reflect those influences, highlighting unique flavors from the region. The book is divided into sections based on ingredient or type of dish, such as meat, fish, stuffed, and meatballs. Like Plenty and Ottololenghi, vegetables often are the star of the dish. The book has gorgeous photographs of the finished dish for most recipes as well as from the city of Jerusalem. So far, every dish I have tried has been a winner, with bold but balanced and flavorful cooking, fragrant with exotic spices and herbs. In terms of difficulty, the recipes are mostly all in the easy to moderately difficult range. Look for upcoming individual recipe reviews with step-by-step photographs for hummus, kawarma, turkey and zucchini meatballs, chocolate krantz cake, and the fantastic chicken with caramelized onions and cardamom rice. Some recipes requires certain equipment: food processor to make hummus, a stand mixer to mix dough for the chocolate krantz cake. More importantly, the Jerusalem cookbook also requires many specialty ingredients that cannot be easily substituted: spices such as sumac and whole cardamom pods, pomegranate molasses, date syrup. Most ingredients can be found at Middle Eastern grocery stores. I found many of these ingredients, including thick labneh yogurt at Crossroads Market in Palo Alto. They also sell spices in bulk, which is a bargain. Penzey’s Spices also carries cardamom pods, sumac, and za’atar. Many recipes feature lamb, which can be somewhat hard to find. Most supermarkets have lamb chops but not other cuts or ground lamb. In the Bay Area, several farmer’s market sellers carry cuts of lamb. Highly recommended. Link to Jerusalem: A Cookbook here. Suzanne Goin is a James Beard Award-winning chef, owner of four restaurants in Los Angeles, and author of one of my all-time favorite cookbooks, Sunday Suppers at Lucques. Sunday Suppers was a massive hit, and I have cooked so many delicious meals from it over the years and still go back to it. She thankfully resisted her editors’ wishes to make things simple a la 30-Minute Meals, because if you are going to take time to cook, it should be delicious. Her food is seasonal, inspired by local produce, with layers of balanced flavors and textures. Eight years after coming out with Sunday Suppers, Chef Goin has just released The A.O.C. 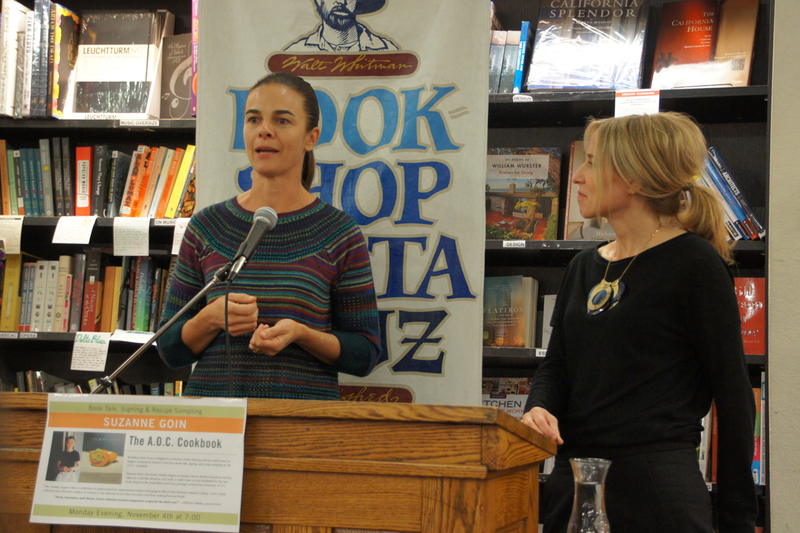 Cookbook, and was recently in the Bay Area for a book tour. Chef Goin told the story of how she opened the restaurant Lucques in LA about fifteen years ago with the philosophy of serving food that she would like to eat, rather than targeting a specific demographic, and in a more welcoming environment than some of the stuffy fine dining restaurants in LA at the time. At Lucques there was a lively bar scene, focused on wine, but it was limited to a small space. She wanted to create that same type of atmosphere but in a larger venue, and thus the A.O.C. wine bar and restaurant was born. There they serve cheese, charcuterie, salads, wood-fire oven cooked items, and desserts, all served on small plates to be enjoyed with wine. For The A.O.C. Cookbook, Chef Goin has modified the small plates served at A.O.C. into more traditionally sized main courses serving six people. Readers of Sunday Suppers will find the format and layout of the recipes very familiar. There is more explanation on why different flavor combinations appear in each dish and similarly, why specific wines are chosen, with wine notes for every dish by sommelier/co-owner Caroline Styne. Chef Goin answered questions from the audience. How does she split her time among four restaurants? The menus at the restaurants change twice per season, and these changes are staggered such that she will often stay at one restaurant for one week for their change, then oversee the change at the next restaurant. She has gone from focusing on perfection for every protein while working at the grill, to stepping back and enjoying the big picture with well-trained staff in place at each restaurant. Where do they get their produce? All sourced from local farmers in Southern California, from Santa Barbara to Inland to San Diego. Often the farmers will bring new products that Chef Goin will then incorporate or make into a dish. What about work-life balance? There are trade-offs in juggling the jobs of chef, restaurant owner, author, wife, and mother, but she emphasized how important it was that when she is with her family she is present and focused on them. Bookshop Santa Cruz is a great independent bookstore in downtown Santa Cruz and did a wonderful job hosting the event. They served delicious recipes from the book (Balsamic Glazed Brussel Sprouts with Pancetta, Roasted Cauliflower with Curry and Red Vinegar, Persimmon Cake with Creme Fraiche and Candied Pecans), and later Chef Goin and Ms. Styne autographed copies of the book and chatted with attendees. Chef Goin will be at Omnivore Books in San Francisco on November 8 at 6 pm. Here is an Amazon link to The A.O.C. Cookbook, but use it only if you do not have a local independent bookstore that carries the book! I try to balance “cheat” days at my favorite bakery (Craftsman and Wolves) with some healthy dinners during the week. One great source for recipes is the Recipes for Health series by Martha Rose Shulman in the New York Times. The recent recipe for beet salsa is really easy and flavorful. I roast the beets covered in foil for about an hour at 400F. The roast beets are diced together with apple, jalapeno, cilantro, and lime juice. The fresh salsa has bright flavors that go well over a simple pan-seared fish fillet such as tilapia. Pair with some green beans for a healthy, flavorful meal. The salsa keeps for a few days in the refrigerator and can be used to accompany other dishes; one delicious application was on top of omelettes. Time: about 1 1/2 hours, including 1 hour to roast the beets.